I’ve been looking at this off and on for awhile now. I finally made a breakthrough this week and started to generate some decent live streams on my Youtube channel, after a lot of misfires. Note this is applicable for Raspbian stretch Lite on a Raspberry Pi 3. However, I firmly believe it will work just the same for regular Raspbian Stretch. There’s a lot of wrong, misleading or outdated information out there on the Internet. Hopefully this will help others to avoid wasting as much time as I had to do. This project was prompted by my desire to make a more generalized fishcam! Described in this post, my original fishcam implementation – and I realized this form the get-go – has very limited applicability because very few people are in a position to have their own AWS server. And if you don’t know what you’re doing, please don’t run your own server – the security exposure is too great. 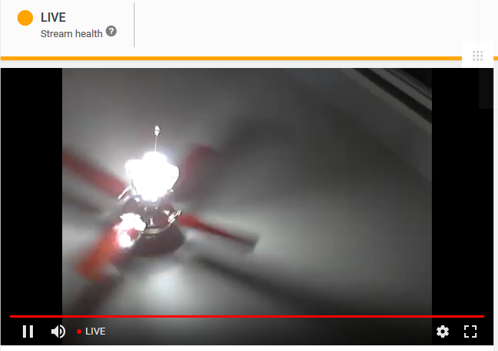 So I eventually realized that maybe I could generalize what I had done – essentially rmeove the dependency on the AWS server – by utilizing Youtube Live Streaming. And, I believe I was right. It’s still a work in progress however. I was playing with ffmpeg. The version I am playing with now comes with Raspbian – no need to compile like in the bad old days. ffmpeg -version shows the version to be 3.2.12. I get the impression that its capabilities are version-dependent, so that’s why this information is particularly relevant in this case. For the record, the bandwidth required was about 2100 kbps. video terrible, but audio good! With this audio's, not too bad, video's a bit choppy. 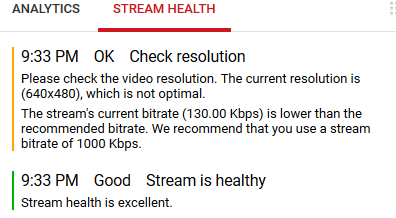 Google reports the stream quality as OK, check resolution. So I fix the bandwidth (which was a typo in the above, but one with an interesting result). I set video bandwidth to -b:v 1200k. Now the video is OK once again, but the audio is choppy again! Weird. bandwidth is about 1100 kbps. But I keep getting inconsistent results! Sometimes a setting will work, and then I come back to it and it doesn’t. Weird. Part of the problem is that I have no idea what I’m doing and I didn’t know when i was watching a livestream vs a recorded (on-demand0 one! I have since learned to look for the little red Live button. A picture is worth 10^3 words in this case. [alsa @ 0x1502700] ALSA buffer xrun. That is working great – showing the video as before but now with a silent audio track. Here I’ve increased video quality a tad by requesting more fps (10) and making qscale 0 (which means highest quality). Bitrate was about 1700 kbps. Quality is maybe a little better. Audio still leaves something to be desired. What is observed to happen is that ffmpeg actually chooses 15 fps rather than 30. I’ve read it decides what it is able to do, so maybe that’s the highest fps it can deliver. Video is pretty smooth (See my Livestream link in references if I happen to have it running. Otherwise I will create a video link.) No drops are recorded, but the sound, though not terrible, has some pops. Bandwidth used is about 1900 kbps. So this is definitely my best effort yet. Youtube complains about the unsupported video size of 640×480, but it permits it and I don’t think it’s a real problem. It’s importasnt to talk about bandwidth if you haven’t given this any real thought. You have to have a halfway decent broadband connection for this to work, you see? If yuo have a mid-speed cable modem or DSL, yuo have much lower upload than download speeds, and yuo may not be able to pull off a reliable 1.5 mbps upload. For those lucky enough to have Verizon FIOS this is a non-issue. But for instance in the highschool where I volunteer they have throttled the guest wifi network to such an extent that achieving this modest 1.5 mbps is going to present a real challenge. If yuo rely on a phone’s hotspot you will also probably be unable to get such a speed. So I may look at more ways to reduce the bandwidth required in the future. Check your bandwidth using speedcheck.org. And between YouTube and your ISP, it just seems the whole thing about live video broadcasting seems, well, delicate. 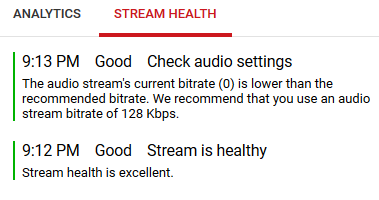 Stream Health varies between oK, to Excellent to not receiving – all during the same streaming session! It often takes five minutes or so for the stream to appear to be working. Someone picked up a really cheap DI Chatcam at Microcenter in Paterson. I think that’s Digital Innovations Chatcam. It’s cute. It has a big clip on the end and shines white LEDs when it’s on. I think it was about $12. With the exact same ffmpeg settings (with audio suppressed), the quality was not nearly as good as with the Logitech webcam. Here’s a link to the YouTube video made with the chatcam: https://www.youtube.com/watch?v=OI2IRV1i__k. Note that it has a ministereo plug for audio. I didn;’t even plug it in now that I know how to suppress audio! I need to re-run this test now that I know how to increase the video quality. My idea to do this is to use the Youtube API and periodically test if the livestream is still working. I have read that it can go down for various reason, and there is no goo way from within ffmpeg itself to tell that your stream is no longer live! It will make for a good project to test the livestream using the Google Developer’s API. that will be a separate post if I ever get it working. If it’s found to be down, the Pi could restart ffmpeg, in my thinking. Fishcam implemented with Raspberry Pi + webcam + help of my AWS server. Check your upload bandwith: speedcheck.org. Microcenter in Paterson, NJ – best to visit in person, or so I have been told. This entry was posted in Linux, Network Technologies, Raspberry Pi and tagged ffmpeg, Microcenter, Speedcheck, Youtube. Bookmark the permalink.